A very exciting Color War has come to an end. All the teams put forth an amazing effort and everyone had a great time participating in many events. Congratulations to the Boys Gray Titans and the Girls Gruesome Grey Monsoon for their wins. Tonight is the Marine Dance and the Order of the Red and Gray, where our campers who have been here for three years, five years, seven years and ten years are honored. Tomorrow we get to watch the year end slide show and video. We are all looking forward to Banquet on Sunday. Although the summer is coming to an end, everyone will have all the memories of a wonderful summer plus all the great and everlasting friendships they have made. We live ten months for two! 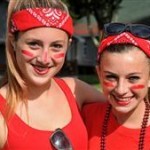 This entry was posted in Uncategorized and tagged Camp Chipinaw, chipinaw, chipinaw @ silver lake, silver lake. Bookmark the permalink.